Description: Free, public domain image: Young Man Jumping Into the Ocean. 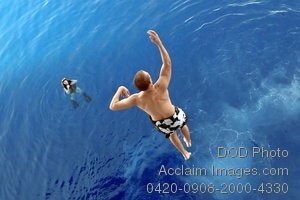 A USS Bataan (LHD 5) Sailor jumps from the ship's hangar bay into the Gulf of Aqaba during swim call. Bataan is serving as the flagship of the Bataan Amphibious Ready Group (ARG), supporting Maritime Security Operations (MSO) in the U.S. Navy's 5th Fleet area of operations. (U.S. Navy photo by Mass Communication Specialist 2nd Class (SW/AW) Jeremy L. Grisham.